Saikaku, lit. "Crane of the West"
Japanese poet and creator of the "floating world" genre of Japanese prose (ukiyo-zōshi). Born the son of the wealthy merchant Hirayama Tōgo (平山藤五) in Osaka, he first studied haikai poetry under Matsunaga Teitoku, and later studied under Nishiyama Sōin of the Danrin School of poetry, which emphasized comic linked verse. Scholars have described numerous extraordinary feats of solo haikai composition at one sitting; most famously, over the course of a single day and night in 1677, Saikaku is reported to have composed at least 16,000 haikai stanzas, with some rumors placing the number at over 23,500 stanzas. In 1642, Ihara Saikaku was born into a well-off merchant family in Osaka. From the age of fifteen Saikaku had begun to compose haikai no renga (linked verse). In 1662 at the age of twenty Saikaku had become a haikai master. Under the pen name Ihara Kakuei, Saikaku began to establish himself as a popular haikai poet. 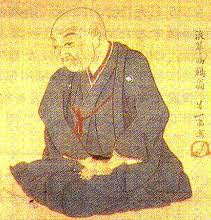 By 1670 Saikaku had developed his own distinctive style of haikai poetry. In essence his haikai style relied on the use of colloquial language to depict contemporary townspeople life. Furthermore, during this time Saikaku also owned and ran a medium sized business in Osaka. In 1673 Saikaku had changed his pen name to the one we recognise today. However, the death of his dearly beloved wife in 1675 had an extremely profound impact on Saikaku. A few days after her passing in an act of grief and true love Saikaku started to compose a thousand-verse haikai poem in a matter of twelve hours. When this work was published it was called ‘Haikai Single Day Thousand Verse’ (Haikai Dokugin Ichinichi Senku 俳諧独吟一日千句). 好色一代男 Koshoku Ichidai Otoko . As Saikaku’s popularity and readership began to increase and expand across Japan so did the amount of literature he published. 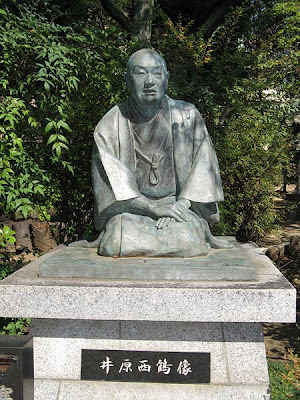 When he died in 1693 at the age of fifty-two Saikaku was one of the most popular writers of the entire Tokugawa period. Yet at the time his work was never considered high literature because it had been aimed towards and popularised by the townspeople chonin. 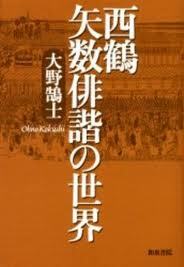 Nevertheless, Saikaku’s work is now celebrated for its significance for developing Japanese fiction literature. On one occasion he produced 10000 haiku in 24 hours in a "haiku marathon"
at a show at Ikutama Jinja 生玉神社　in Osaka in front of the laughing crowd. He sits there like a rakugo story teller, ready to make his audience laugh. Shrine Ikutama jinja is the cradle of laughter and Rakugo story telling in Osaka. 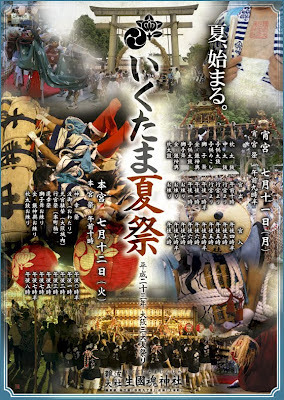 To our day, the Kihachi festival is held there. A bronze statue of Ihara sits in the compound of Ikutama shrine. Within 12 hours or even 24 hours without a break, the performer had to produce one haiku (senryu) after the other. Ookukazu 大句数 "many many haiku"
In May of 1677 Saikaku produced 1600 haiku at Ikutama shrine compound, temple Hongaku-Ji本覚寺. In September 1677, the poet-performer Geshooken Kishi 月松軒紀子 produced 18000 haiku in 24 hours in Nara, at temple Gokuraku-In 極楽院. In 1679 the poet-performer Ooyodo Michikaze 大淀三千風 produced 3000 haiku in Sendai. In June of 1684, he produced a record of 23500 haiku 西鶴大矢数 at the shrine Sumiyoshi Jinja 住吉神社前, in quite a shamanic performance from morning to next morning. - so many poem arrows ! Saikaku was talking so fast that the scribes could not record all the poems - imagine a new verse every 16 seconds.
. WKD : yakazu 矢数 "large number of arrows" .
. Sumiyoshi Jinja 住吉神社 Sumiyoshi Shrines .
. WKD : Rakugo 落語　.
. . . . . It is almost certain that Kikaku met Kyorai for the first time when the former was visiting Kyoto.
. . . . . Kikaku set out on a journey for Kyoto and Osaka area in the summer of Jokyo 1 (1684). The famous haikai feat by Saikaku Ihara was performed on the 5 June and Kikaku was asked to play the role of Koken (official assistant) for him. The venue was Sumiyoshi Shrine in Settsu. Here, Saikaku is said to have performed a Doku-gin (solo renku) in which he created 23,500 stanzas within a single day and night. There is a poem by Kikaku which recalls this occasion. What the poem means is that while Saikaku Ihara was churning out one poem after another at an incredible speed comparable to that of the legendary thoroughbred that was said to be able to gallop one thousand ri (about 2,440 miles) a day, Kikaku was assisting the Master like a fly. At that time Saikaku was 43 years old, well-established and influential whereas Kikaku was 24 and only a young upstart. Despite his youth and relative inexperience Kikaku was given this very responsible job as an official assistance of the big man. Also, in spite of the significant age difference in feudal Japan the two were good friends. This was partly because Saikaku recognised Kikaku’s unusual capability and was magnanimous towards him but it was largely because Kikaku was such an outstanding talent. The most popular haikai of Basho's era was a sophisticated, urban style, not Basho's style(s). "....Basho, even at the peak of his career, was only one of a number of prominent haikai masters--- Gonsui (1650-1722), Shintoku (1633-98), Onitsura (1661-1738), Raizan (1654-1716), Saikaku (1641-93), Saimmaro (1656-1738)--- and was far from having the largest or most influential school. The Basho school did not flourish in the major cities--- Kyoto, Osaka, Edo--- which were the centers of haikai activity, and was dominated by other schools, especially by Teimon and Danrin poets, and by those who practiced 'maeku-zuke' (verse-capping), which ran directly counter to the Basho style. Basho first established himself in Edo and later had a base in Kyoto, but his main following emerged in the provinces, particularly in the Owari (Nagoya), Mino (southern Gifu), Oomi (surrounding Lake Biwa), and Kaga (southern Ishikawa) areas. After Basho's death, his disciples formed their own individual followings, and his school rapidly faded. And yet within a hundred years of his death, Basho had been enshrined, deified as the saint of haikai." "...in some cases...the diction is coarse and the expression vulgar. Even when it comes to depicting human emotion, the focus is on the clever minds of today. The result is Saikaku's degenerate style. ...."
"Both Saikaku and Basho began as haikai masters and took up haikai prose in mid-career, but unlike Saikaku, who sped up the pace of linked verse and minimized the shifting and change until it turned into prose fiction, or 'ukiyo-zooshi' (tales of the floating world), Basho moved in the opposite direction, reworking and condensing the prose into poetry. 'Narrow Road to the Interior' is in fact best considered a long prose poem, which gives vernacular and Chinese phrases the cadence and tonality of poetry." "His style of haiku-writing was criticized not only by the Teimon School but also by the School of Basho as being wretched and dissolute. He wrote very few good hokku..."
But a comparison to "automatic" writing is a good one. "As one example of 'automatic writing,' Japanese surrealists could have pointed to the late-seventeenth-century pastime of 'yakazu haikai' (literally, 'counting arrow poems') in which the poet orally recited as many original verses as possible in a given period, usually twenty-four hours. The all-time champion, Ihara Saikaku (1642-93), supposedly recited 23,500 poems in a single day and night in 1684, at the Sumiyoshi Shrine in Osaka. With his phenomenal average of one poem every 3.7 seconds, the scribes could only record the number of poems, not the indvidual words. Japanese surrealists could have found in Saikaku's works traces of the same high-speed, spontaneous approach to language, and they would have discovered abundant leaps of logic and passages of free association." Harvard Journal of Asiatic Studies 52:2, 1992, pp. 481-588. Harvard Jn. of Asiatic Studies 52:1, June 1992, pp. 5-75.
matched by a ending (Japanese, ketsu). line 4 resolves all into an ending (Chinese, he). 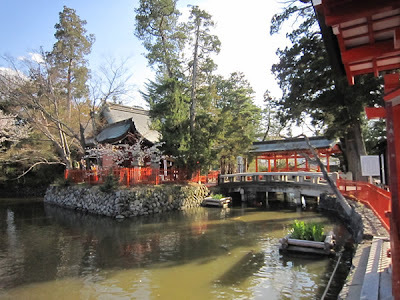 A place of worship since 806, when Emperor Heijo came here　after ascending to the throne which he held until 809.. The enshrined object is “Japanese Sake” or “Soil”. Since this shrine is the geographical center of Japan, this is called ”The navel of Japan” and enshrined a guardian of the entire country. He is the protector of the land and the islands of Japan. 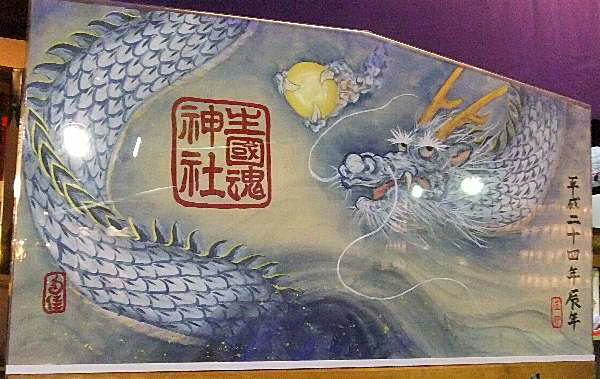 Tarushima no kami 足島神 "Fulfillment"
These two deities are one pair, IKU to create and develop the land, TARU to bring it to fulfillment and prosperity. When a new emperor took office, a messenger was sent from Kyoto to this shrine to make the announcement. 80 islands is synonym for the many islands of Japan. Engishiki-Myojintaisha that started when the gods Ikushima-no-kami and Tarushima-no-kami were enshrined in Ishiyamazaki (currently the area around Osaka Castle). The shrine burnt down in the 8th year of the Tensho Period (1580) during the Ishiyama battle, but when Hideyoshi Toyotomi built the Osaka Castle in the 11th year of the Tensho Period, it was moved to the current location. The main pavilion was built two years after relocation, in Ikutama-zukuri style, a style unprecedented in shrine construction, with the main and the adjacent pavilions under one nagarezukuri-style roof, and three gables of chidori-hafu (plover gable), sugari-kara-hafu (cusped gable), and another chidori-hafu. The current main pavilion was rebuilt after the war and now has concrete walls and sheet copper roofing, but still passes on ancient remnants of the Momoyama Period. The shrine is crowded on certain dates when ceremonies are held every year: on June 30th, the Oharae Ceremony is held to drive away bad luck and illnesses; on July 11th and 12th, the Ikutama Summer Festival; on August 11th and 12th, the Osaka Takigi Noh; and on the first Saturday of September, the Hikohachi Festival, which is held in relation to Hikohachi Yonezawa, the originator of kamikata rakugo. The analysis of ”Yorozu no humihougu” written by Saikaku Ihara, 井原西鶴の『万の文反古』の文体分析; It's said that the works of Saikaku Ihara is one of the main influences for most proceeding novels in Japan. He died 320 years ago, but a lot of problems have been left unresolved. This study focuses on “Yorozu no humihougu” which has authorship problems. 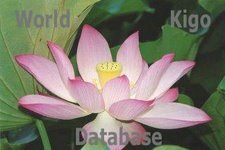 We used for analyzing the tools of quantitative analysis. This article focuses on chapters in Kōshoku ichidai otoko in which condemnations of commoners' hubristic behavior are undermined by parodic passages rendering the text guilty of the rhetorical equivalent of what it condemns. It posits these contrasting elements as setting a pattern of tension between narratorial moralizing and the surrounding narrative typical of Ihara Saikaku's fiction. 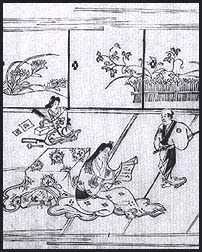 Elucidating Saikaku's intricate style, the article explores the range and functions of parody in his fiction, arguing that rather than ridiculing the elite texts it takes as its objects, Saikaku's parody functions primarily to transfer their prestige to the prosperous chōnin milieus depicted.